When was the last time you gave your body a break? And we're not talking about sleep. Take ten minutes and try the body scan practice. When was the last time you noticed how your body was feeling? Not just when you have a headache or you’re tired or you have heartburn after that spicy taco you ate for lunch. But just noticing how your body is feeling right now, while you’re sitting or standing or lying down. How about noticing how your body feels while you’re sitting in an important meeting or walking down the street or playing with your children? In our busy, high-tech, low-touch lives, it’s easy to operate detached from our own bodies. They too easily become vessels we feed, water, and rest so they can continue to cart around our brains. We don’t pay attention to the information our bodies are sending us or the effect that forces such as stress are having—until real health problems set in. Let’s take a small and simple step in the direction of paying our body the attention it is due. Consider spending just a few minutes—every day, if you can—to notice your own physicality. Not to judge your body or worry about it or push it harder at the gym, but to be in it. Here’s an easy body-scan practice to try. It will tune you in to your body and anchor you to where you are right now. It will heighten your senses and help you achieve greater levels of relaxation. You can do it sitting in a chair or on the floor, lying down, or standing. 1. Settle into a comfortable position, so you feel supported and relaxed. 2. Close your eyes if you wish or leave them open with a soft gaze, not focusing on anything in particular. 3. Rest for a few moments, paying attention to the natural rhythm of your breathing. 4. Once your body and mind are settled, bring awareness to your body as a whole. Be aware of your body resting and being supported by the chair, mattress, or floor. 5. Begin to focus your attention on different parts of your body. You can spotlight one particular area or go through a sequence like this: toes, feet (sole, heel, top of foot), through the legs, pelvis, abdomen, lower back, upper back, chest shoulders, arms down to the fingers, shoulders, neck, different parts of the face, and head. 6. For each part of the body, linger for a few moments and notice the different sensations as you focus. 7. The moment you notice that your mind has wandered, return your attention to the part of the body you last remember. If you fall asleep during this body-scan practice, that’s okay. When you realize you’ve been nodding off, take a deep breath to help you reawaken and perhaps reposition your body (which will also help wake it up). When you’re ready, return your attention to the part of the body you last remember focusing on. 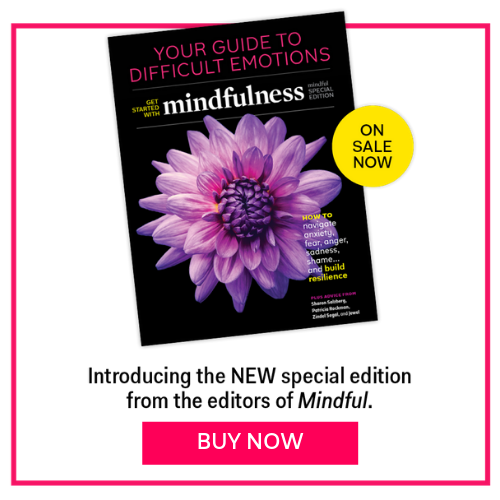 This article also appeared in the February 2014 issue of Mindful magazine. Susan Bauer-Wu, PhD, is a registered nurse and nursing educator, as well as a mindfulness teacher and researcher. She is president of the Mind & Life Institute and author of Leaves Falling Gently: Living Fully with Serious & Life-Limiting Illness through Mindfulness, Compassion & Connectedness.